The Bluesfest is a five-day festival, which will be held this year from 28 March to 1 April. 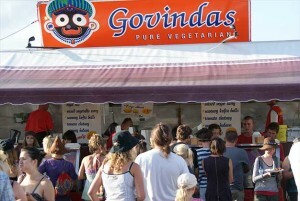 This is a major event in the New Govardhana catering service calendar, and requires considerable forward planning. First, there is a comprehensive application procedure. This includes proof of essential licences and the payment of substantial fees. Then there is the preparation of the nine metre travelling kitchen and all the extensive equipment needed. About 12 to 14 workers will volunteer their services for the five days. The core group will work from 7.30 am to 2.00 am each day, for the whole five days. They will rise early to chant their rounds. Purchase of the produce needed for the five days includes up to 1.5 tonnes potatoes, 800 kg carrots, 500 kg rice and 450 kg flour. Many other items are also required for the prasadam preparation. Salads will be introduced for the first time this year. Particular favourites are the kofta balls (in the past, up to 65,000 have been sold during the five days) together with nine to ten thousand feast plates. The rewards for this entire endeavour are the favourable reactions from everyone when they taste the preparations. Many people are visibly moved by their experience of prasadam, and the fact that it is identified with the Krishna Conscious movement is always gratifying. Also, the profits help towards financing New Govardhana and its upcoming projects. From high-end entertainment to the expression of folk-life through grassroots and community activities our multifaceted National Folk Festival is the ultimate celebration of all things folk. The program is designed to inspire, enliven and entertain. From traditional and contemporary grooves to the quirky and the endearing it features all the key elements that make people want to come from everywhere to be part of it. Our vibrant festival site is populated with themed bars, food and market stalls, circus performers and roving musicians and our multi-disciplinary program is broad and innovative boasting an A-list of performers from Australia and the world. 18 venues provide a range of concert experiences from our big stages to more intimate spaces where you can enjoy a more up-close experience with our performers. We'll respond to your message within 48 hours!